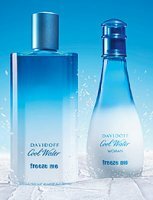 Davidoff will launch two new limited edition Cool Water fragrances in March, Cool Water Freeze Me and Cool Water Woman Freeze Me. Davidoff Cool Water Freeze Me for men was developed by perfumer Philippe Bousseton, and includes notes of limone, mandarine, grapefruit, sea accord, basil, sage, mint, gin, geranium, amber, frankincense and musk. It will be available in 125 ml Eau de Toilette. Davidoff Cool Water Woman Freeze Me was developed by perfumer Pierre Bourdon, and features pineapple, mint, sea accord, violet, magnolia, lily of the valley, summer jasmine, sandalwood, iris, peach, amber and musk. It will be available in 100 ml Eau de Toilette. (via cosmoty.de) Other recent launches from Davidoff: Davidoff Adventure. I don't usually like aquatic, but the notes here do sound kind of cool — I'll look for these when they launch! Loved the original a year or two after it's launch in 1997. Now all of his releases are slight alterations of the original. I can guarantee this will be indistinguishable from the first. Even the notes are reminiscent of Cool Water. Maybe I'll be surprised.